I’m a great admirer of Jamie Carragher. He was an excellent footballer, an inspirational Liverpool captain, and by all accounts he’s turning out to be a very fine pundit. I haven’t seen much of his punditry but I did read an article he wrote recently under the headline: ‘Gareth Bale should come home to the Premier League’ (http://www.dailymail.co.uk/sport/football/article-3083586/JAMIE-CARRAGHER-Gareth-Bale-come-home-Premier-League-s-fight-t-win-Real-Madrid.html). Carragher is wrong and he’s mistaken in just about every line of argument he makes. Here I consider each of the arguments that Carragher makes (I counted 15 in all) as to why Bale should bail out of Madrid and return to the welcoming arms of one of the Premier League’s premier teams. Bale would be assured legendary status elsewhere. Possibly, but hardly a foregone conclusion. It’s not even obvious that he would be the most important player at the club if he signed for Manchester United, Manchester City or Chelsea. Besides, for the moment, Bale does not appear to want to be a legend elsewhere; he wants to be a legend at Real Madrid. It is only twelve months since he scored in the Champions League final against Real’s city rivals to help his team land their coveted 10th European Cup win. It capped a magnificent first season for the Welshman in Madrid. He seemed well on the way to legendary status at the time. His star has undoubtedly dimmed in the Madrid galaxy since then but the notoriously fickle fans at the Bernabeu who have turned on Bale can swing back just as quickly to revering him. The Madrid fans love a scapegoat and Bale is now it. It’s true that they do and Bale has been suffering at the hands of the white hanky brigade but he’s far from alone. The Madrid fans prefer a whole herd of scapegoats and Casillas and Ancelotti both currently find themselves in that pen as well. The goalkeeper and the manager are also both more likely to leave Madrid this summer than Bale in my opinion. Bale currently appears timid, lacking in confidence and has lost his spark. This description would be apt for several Real Madrid performances of late. Since the turn of the year the team has not been functioning well and Bale’s confidence has understandably dropped along with many of his teammates (although I don’t think Ronaldo has ever had any problems in the confidence department). But are we really now suggesting that when a player loses confidence and a bit of spark the only thing to do is change clubs? Confidence comes and goes even for the very best players in the world. It can come again for Bale as a Real Madrid player. This is about Bale’s career; no one benefits from him being unhappy. One indifferent season does not define a career. This is not a career-defining summer for Gareth Bale. He’s 25 years old, playing for the club of his dreams, and challenging for trophies (he’s also a multimillionaire). If that’s unhappiness, I’ll take a bit of that thank you very much. Bale may well decide to return to the Premier League at some point in the future and he has many years at the top of the game still ahead of him. It’s not an option he needs to take up right now. Bale can never compete with Ronaldo setting the agenda at Real Madrid. True, he can’t, but I don’t believe he’s trying to. I’ve never met Gareth Bale but for the most expensive footballer in the world he seems like a remarkably humble guy. He knows who is king in Madrid and that he is merely a prince. Ronaldo could do more to help Bale (and the rest of the team) if he was a little less preening and self-absorbed. The Portuguese is a remarkable talent but not a natural leader. Bale will be measured against other world record signings at Madrid such as Ronaldo, Zidane and Figo. Carragher’s implication is that Bale cannot hope to compare. He’s not as good as any of the three mentioned above and quite possibly never will be. The point though is that Bale has enough confidence that he wants to be measured against that sort of talent. He wants to be better and he’s pushed himself out of his comfort zone in a bid to improve. In my view there’s no doubt that he’s become a more complete player since he moved to Spain. Madrid is a culture shock for a shy boy like Bale, especially with the expectation to win the league and the Champions League every year. It would be a major surprise if moving to a new country did not prove to be a bit of a culture shock. As an expat, I have some experience of this. Indeed, my wife and I had a bit of a culture shock when we visited Madrid. We decided to go out and see what Madrid nightlife had to offer. We turned up at a bar around midnight (thinking that things start a little later in Spain) only to discover that we were the only ones there. Apparently the locals don’t make an appearance until around 2am, after they’ve finished their dinner. If Bale signed for one of the big English clubs he would face a similar level of expectation. They will all be eyeing the title next season and see themselves as at least contenders (with the possible exception of Manchester City) in the Champions League. Bale has nowhere to run or hide from expectation. Bale’s personality is not coming to the fore at Madrid. I’m not entirely sure what Gareth Bale’s personality is and I’d be surprised if Carragher has a much better idea. Bale has never been the most demonstrative of players; he’s not one for shouting or screaming and being overly dramatic about things. He tends to let his football do the talking. Sadly, admittedly, some of that talk has been gibberish of late. The only concern about Bale’s personality is if it’s leading him to become isolated at the Bernabeu. It’s widely reported that his Spanish remains about as good as my Croatian (that is to say not very – and I don’t even know how to say “not very” in Croatian) and that’s probably the most important thing for him to work on. This summer he should take a holiday, in Spain, and spend much of it taking Spanish lessons. One of the big English clubs would have been a step-up from Spurs but not such a huge one as Real Madrid. This seems like more of an argument for not going to Madrid in the first place. Carragher is right of course, Real are bigger and better than any club in England right now and the culture shock wouldn’t have arisen if Bale had joined another English club. But why reign in his ambition? He thought he was good enough to play for Real Madrid and he’s proved that he is. 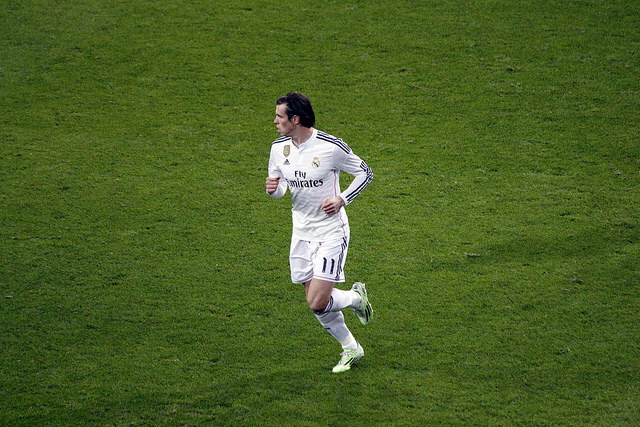 Even with his less impressive form this season, Bale has remained a regular starter at Real. Ancelotti trusts him and Bale trusted himself to play at that level. The Premier League has lost too many players to La Liga recently – Ronaldo, Alonso, Suarez – and Bale coming back would balance things a little. This one’s easy, why should Gareth Bale care about that? Bale would have more influence in the Premier League than he has in La Liga. Influence is a tough thing to measure. It may be the case that the style of play in England would suit Bale better (I think that’s true of attacking players more generally) but the influence he’s had in Spain should not be underestimated. Bale is one of those players who force the opposition to think about how they’ll cope with him just by his presence on the team sheet. Bale would automatically improve any English side he joined. That’s true and there would be no shortage of suitors if he was put up for sale but let’s not forget that Bale improved the Real Madrid team when he joined. He’s kept his place in the team on merit. It is arguable that one of the big English clubs would build their team around him if he joined them in a way that Madrid won’t but I don’t think Bale sees that as necessary. He’s not been a failure at Madrid – he’s won 4 medals – so could return to England with his head held high. He certainly could but those four medals tell a very important story. He wouldn’t have collected four medals at any of the top English clubs in the last two seasons and he almost certainly wouldn’t (yet) be a Champions League winner if he’d opted to stay in the Premier League rather than join Real. Bale wants to be challenging for the biggest prizes in the game and there’s not many better places to do that from. In fact, there’s only one and it’s not in England. I don’t think Bale will be joining Barcelona any time soon though. Real Madrid does not suit everyone – think of Kaka, Robben and Sneijder. That’s true of any club. Look at what happened to Torres after he left Liverpool. Bale has chosen to do it ‘his way’ at the Bernabeu and if he can make it there, he’ll make it anywhere. It’s a tough test for any player and probably the most demanding stage for a footballer to perform on. Bale hasn’t gone there to be an understudy and he can consider himself a headline act in his own right. It would be good to see Bale playing with happiness again. On this point, Carragher and I agree. I just happen to believe that he can find happiness again at Real Madrid. A year ago Bale was preparing for a Madrid derby Champions League final. He scored a crucial goal in that game. The Real Madrid fans waved white flags rather than white hankies and chanted his name. Platini put a Champions League winner’s medal around his neck. This year he wears the burden of his record transfer fee around his neck. There will be no all-Spanish Champions League final this season, no medal to add to Bale’s collection. I’m sure he’ll watch the game on TV and wish he was there. But if he wants to be back in the Champions League final next year he’d be better off staying in Madrid than heading back to England.